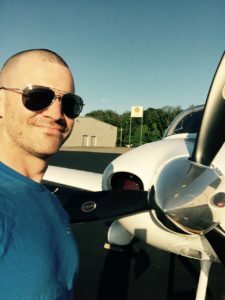 Tristan has been flying out of the Beverly Flight Center since obtaining his private pilot’s license in 1998, and instructing since 2004. Growing up less than a mile from the airport, airplanes were constantly flying overhead and hard to ignore. Most days Tristan rode his bike to the airport instead of the ball field after school. During the summer he would wash airplanes in trade for lessons. He soloed at age sixteen, riding his bicycle home after because he didn’t even have a driver’s license yet. A graduate of the North Shore Community College Aviation Science program, Tristan continued on to attain his flight instructor certificate and has been teaching here at BFC ever since. Although qualified to teach anything from private pilots to commercial ratings, he specializes in basic aerobatics. Whatever your needs, Tristan will work with you to meet them in the safest and most proficient means possible.